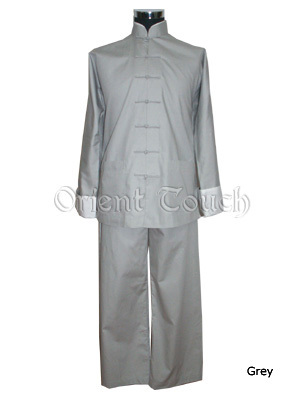 This Chinese traditional style mandarin suit is of rare and winning combination and is elegantly comfortable. It is made of quality cotton and designed with frog button closures. With straight leg matching pants designed with both elastic band and cotton band, this is a versatile outfit that can be worn for almost any occasion: as casual everyday wear, as a Kung-Fu practice uniform?It makes you unique and impressive!